Rev. J. Pearse Mansfield, Pastor of Horningsham Independent Chapel. James Pearse Mansfield was born in Crediton, Devon to parents William and Susanna and baptised in Broad Street Independent Chapel on the 14th October 1832. 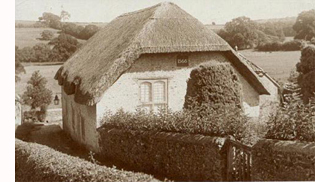 He must have decided to change career direction from a Currier (preparing hides for leather making) to study for the ministry, and in 1861 (aged 29) he became the Minister at England's oldest Free Church, in Horningsham, Wiltshire, now the Congregational church in Chapel Street in the village. He had married Mary Anne Perryman of Sandford who gave birth to their children, Theodosia and Orlando. Both Mary Anne and James Pearse died at the relatively young age of 56 in Melksham, Wiltshire.Theodosia Olympia (Born 25th August 1862) became a Governess to a Catholic family and later joined The Order of Discalced Carmelites in Wells, Somerset about 1896. She was professed on 31st May 1898 and adopted the religious name of M. Angela of the Holy Family. She died on 23rd August 1937. Orlando had a gift for music and became an accomplished organist, probaly practising on the little organ in the church. He went on to become a Doctor of Music and worked for a while in the USA before retiring to Cheltenham. Above: Extract from the 1881 census of Devon. "On April 25th 1861, the Rev. J. P. Mansfield was appointed pastor, and he exercised a successful ministry of nearly 23 years. He has been described as a man of strong will, deep intellect, great organising ability, and evincing an enthusiasm which remained with him to the last. Many joined the church during his time, the ordeal of joining being somewhat lessened by a resolution to dispense with the recital of spiritual experience which had been required of candidates, but, on the other hand the discipline, in the form of expulsion, was exercised in several cases. The first task to which Mr Mansfield addressed himself was the renovation of the Church. The work comprised a new floor, new pews, thatching and general decoration. The cost was £200. Of this about £50 was raised by the congregation and the remainder came as gifts from sister churches." Above is an extract from: The story of England's oldest free church by the Rev. Albert E. Banton.